Bearings manufactured by GGB Bearing Technology, an EnPro Industries, Inc. (NYSE:NPO) company, are helping NASA’s Curiosity rover explore the surface of Mars. GGB’s DU® metal- polymer bearings are critical components in the drill that Curiosity is using to sample rocks in the Martian landscape. The self-lubricating DU® bearings feature high resistance to wear and the ability to function in the harsh conditions and temperatures found in the Martian atmosphere. The bearings can operate successfully at temperatures in a range from -328 oF (-200oC) to +536 oF (+280oC). Engineered and built by NASA’s Jet Propulsion Laboratory in Pasadena, Calif., Curiosity’s mission is to investigate conditions on the planet to see if they may have been conducive to microbial life. The investigation requires obtaining and analyzing dozens of samples scooped from the ground or drilled from rocks. 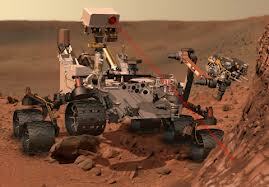 A robotic arm on Curiosity is capable of drilling into Martian rocks to a depth of one inch, or 2.5 cm. The drill acquires samples by rotating and hammering the rocks with weight applied to the bit. Three DU® metal-polymer bearing segments serve as the primary suspension components for the drill spindle, one of four robust components that allow the drill to operate in the environment on Mars. In addition to the spindle, which rotates the bit, the drill includes a chuck that engages and releases the bit; a percussion mechanism that hammers the bit: and a linear translation mechanism. In addition to their use on Curiosity, GGB’s DU bearings are used in a diverse range of industrial applications on Earth, and are well-known for offering excellent low-friction performance and wear resistance in a wide range of loads, speeds and temperatures.